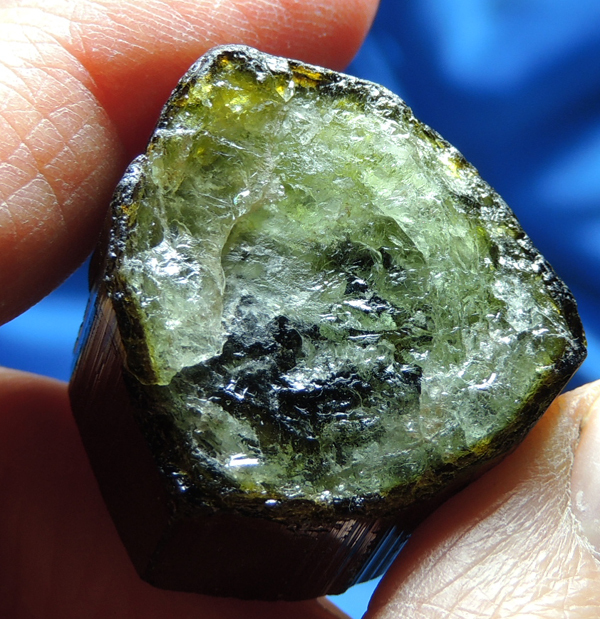 This is a very deep green Brazilian tourmaline that fades into a lime green tourmaline at the base! On top, the green is so deep that unless you can strongly backlight, you don’t even know that this tourmaline is a deep-deep-deep green! She is otherwise a perfectly formed and classic tourmaline crystal. But the oddest thing … she has rounded, layered record keepers on her flat termination! This is very unusual in the tourmaline realm! She has a few teeny dings along the edges and is 0.9 oz and 1.05" by 1.05" by 0.7" … and ready to report for duty! This incredible Spirit is wonderful for laying on the body during crystal healing or Reiki treatments. Her soft energies are perfect for heart Chakra work where she can soothe and heal while the other crystals move blockages and negativity. I love the watermelon effect – showing that the heart healing begins with communication, expressing peace and love – the true voice of the heart. She offers gentle protection so that when you speak what is in the heart, you need never be afraid; she also shows you how to speak without hurting others, a very crucial trait. She is an awesome Spirit!